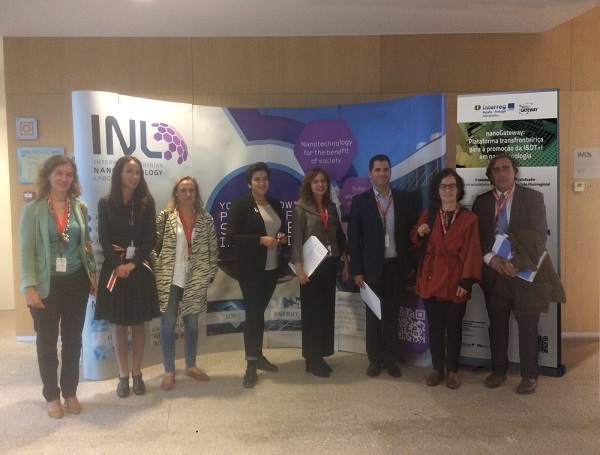 The NanoGateway Project, a €1.013.028 pluri-regional project led by INL and funded by the INTERREG V-A España-Portugal (POCTEP) held its first project meeting jointly with the presence of regional representatives at INL on October 20th. The project aims at implementing a pluri-regional strategy and action plan to explore and unlock the potential of nanotechnology in the generation of smart growth and well-being by developing a new collaborative approach among all actors of innovation value chains. INL, as Coordinator of the project together with the support of regional representatives and institutions, intends to strengthen the capacity to develop excellence in R & I and collaborative RTD projects on nanotechnology-based solutions and products in benefit of the industry and society. INL and key stakeholders from the eight Spanish and Portuguese Cross-Border regions will work together on the establishment of a network in the area of nanotechnology, setting the pillars for excellent research and deployment of nanotechnologies, reinforcing the competitiveness of industry and thus, the global competitiveness of the POCTEP regions.